We now come to the last (but certainly not least) BCS conference--the SEC. What can we expect in the deep south this fall? This first paragraph will explain how SDPI is calculated. So if you want the meat of this article skip on down. In the 2009 SEC regular season, conference play only, championship games excluded, the average SEC team gained and allowed 2757.583 yards. The standard deviation for yards gained (offense) was 362.41 yards. The standard deviation for yards allowed (defense) was 421.56 yards. Georgia gained 2867 yards and allowed 3035 yards. Their offensive SDPI was 0.30 = [(2867-2757.583)/362.41]. Their defensive SDPI was -0.66 = [(2757.583-3035)/421.56]. Their total SDPI was -0.36. This number ranked 7th in the SEC. To refresh your memory, here are the 2009 SEC standings. Now here are the 2009 SEC SDPI standings. The standings are sorted by division by total SDPI with ranking for each category (out of 12 teams) in parentheses. The 2 teams that combined to go 16-0 in conference play in the regular season rate out statistically as the 2 best teams in the league. The biggest disconnect between the actual and SDPI standings comes down on the bayou in the form of LSU. The Tigers finished all alone in second place in the SEC West despite being outgained by about 33 yards per game in league play. The Tigers' biggest deficiency was their anemic offense, which if not for Vanderbilt, would have been the worst in the SEC. However, the defense was solid and allowed the Tigers to hang around and pull out close victories (3-1 in one-score conference games). In 2 of those wins (Mississippi State and Arkansas), which the Tigers won by a combined 7 points, their special teams and defense contributed a combined 3 touchdowns. Those 3 individual plays were likely the biggest difference between a 5-3 and 3-5 conference record. In a league dominated by defense, the Rebels moved the ball well against everyone save South Carolina and Alabama. The Gamecocks and Tide held the Rebels to 460 combined yards. In their other 6 conference games, the Rebels averaged 441 yards per game. The Commodore defense was not very good, but if you're looking for a culprit for their winless league season, its clearly the offense. The Commodores averaged 235 yards per game in SEC play. They never once eclipsed 300 yards (topped out at 297) and scored only 5 offensive touchdowns in their 8 conference games! This was the area of the Gators team that really allowed them to contend for the SEC and national title. Prior to the SEC Championship Game, during which Alabama gashed the Gators for 490 yards, only a single conference foe topped 300 yards against the Gator defense (Arkansas had 357 in their near upset). Besides their yardage totals, one of the most amazing aspects of the Tide's performance against the Gators were their 3 rushing touchdowns. In the regular season, the Gators allowed exactly 3 rushing touchdowns to their other 8 SEC foes. Every SEC team gained at least 300 yards against the Hogs (best performance came when they allowed 326 versus LSU). If the defense had been just a little better, Arkansas could have had a special season. They lost 2 games when they scored 41 and 30 points respectively. If there is going to be a time for the Gators' strangle-hold on the East to be broken, this will be the year. The Gators have won 3 of the last 5 SEC East pennants since Urban Meyer took over prior to the 2005 season (and 3 out of the last 4). Meyer will be breaking in a new quarterback as John Brantley takes over for the departed Tim Tebow. The Gators also lose a pair of standout pass catchers in Riley Cooper and Aaron Hernandez. The defense, the real strength of last season's team, also loses some playmakers, particularly linebackers Ryan Stamper and Brandon Spikes. The window is open for other teams to sneak in, but who is most likely to do it? Georgia is coming off their worst season (statistically) of the Mark Richt era and will be playing with an inexperienced quarterback as well. Tennessee was the second best team in the division last season, but their polished quarterback and coaching staff have flown the coop and headed west. What about South Carolina? Can they end the triumvirate that has dominated the East since the divisional format began (Florida, Georgia, and Tennessee are the only schools to win the East)? One would think this is their best chance with an improving junior quarterback in Stephen Garcia and an emerging sophomore receiver in Alshon Jeffery. The Gamecocks also have a more favorable schedule this season, with Georgia, Tennessee, and Arkansas all making the trek to Columbia, while half of their SEC road games come against Kentucky and Vanderbilt. Speaking of the 'Cats and 'Dores, Kentucky will begin a new era under Joker Phillips in 2010. It will probably look very similar to the end of the Rick Brooks era. 3 non-conference body bag games (Western Kentucky, Akron, and Charleston Southern) will have them half way to bowl eligibility, so they will just need to find 3 other wins somewhere in the SEC schedule and in their in-state battle with Louisville. For Vanderbilt, the offense can't possibly be as bad as it was last season, so the 'Dores should once again be a competitive SEC lightweight that notches a few wins. However, they did themselves no favors with a non-conference slate that actually includes living, breathing, foes in Northwestern, Connecticut, and Wake Forest, so a bowl bid is unlikely. In the West, it looks like a repeat, at least for the division title (and in this case a 3-peat), is probable for the Tide. The quarterback, Heisman Trophy running back, and top-2 receivers all return to a solid, if unspectacular offense. The defense loses some talent at each level with monstrous tackle Terrence Cody, athletic linebackers Rolando McClain, and playmaking defensive back Javier Arenas all departing. Still, by season's end, Nick Saban should have the defense playing if not at an elite, then at a very high level. So who is their biggest threat? Arkansas has the offensive punch to hang with the Tide, but their defense was last in the conference last season. Ole Miss was statistically the division's second best team last year, but their quarterback and do-it-all running back are gone along with a pair of talented defensive linemen in Emmanuel Stephens and Greg Hardy. The Auburn offense improved by leaps and bounds under the tutelage of Gus Malzahn in 2009, but now the Tigers must also replace their starting quarterback and running back (sense a pattern here?). The other Tigers from Baton Rouge do bring back their starting quarterback, but lose his top-receiver and the team's top-2 rushers from an offense that was not exceptional to begin with. And finally we have Mississippi State, which for the first time in a long time had an average offense under first year coach Dan Mullen. Can it get even better in year 2? Unfortunately, the Bulldogs also lose their starting quarterback and running back, and just as anyone who has ever started an exercise regimen will inform you, its a lot easier to go from out of shape to average fitness than it is to take the next step and go from average to proficient. In our offseason retrospective, we now come to the Pac-10, the lone BCS conference on the west coast. Here's how its played out over the last 5 seasons. First off, here are the combined Pac-10 standings from 2005-2009. No real surprise at the top. Despite a down year in 2009, the Trojans are still 4 games clear of their closest competition in the last half-decade. Washington and Washington St are the only Pac-10 teams to not have a winning conference record since 2005 (both topped out at 4-5) and they are also the only 2 teams to go winless in league play in that span. Washington did it first in 2008, and their brethren from Pullman followed them up with a winless conference season in 2009. Since the Pac-10 went to a 9-game conference season in 2006, no team has gone unbeaten in the league (Southern Cal finished 8-1 in 2008 and Oregon finished 8-1 in 2009). Now here is the standard deviation of each team's conference record (in wins). Teams are ranked from the most inconsistent to the least. Stanford has been the most inconsistent Pac-10 team over the past 5 seasons. That's no real surprise when you examine their record. In 2005, under the tutelage of Walt Harris, they finished a respectable 4-4 in the Pac-10. The very next season, they endured one of the worst conference seasons in recent memory. If not for the lamentable seasons put up by both Washington schools in 2008 and Washington St in 2009, the 1-8 Cardinal campaign 0f 2006 would stand as the worst team season of the past 5 years in the Pac-10. Of course, just 3 short seasons later, Jim Harbaugh had the Cardinal in contention for the Rose Bowl as they finished with a 6-3 conference record. Southern Cal has been the most consistent Pac-10 outfit of the past 5 years. Aside from their plunge into mediocrity in 2009, the Trojans had won 7 or 8 conference games from 2005-2008. Now here is each team's point differential in conference play since 2005. Again, no real surprises here. The Trojans have outscored their conference opponents on average by about 16 points per game since 2005. If we just focus on their run from 2005-2008 (the Trojans were just above the break even point in 2009), that number jumps to over 19.7 points per game. Oregon is the only team besides Southern Cal to not be outscored in any one season. Washington State has been outscored by 653 points over the past 2 seasons. This means, on average, their Pac-10 opponents have beaten them by 36.3 points per game! With this being the end of the decade, here's the tally of conference titles. We're giving Washington State credit for the 2002 crown they shared with Southern Cal because they beat the Trojans head-to-head. Similarly, for Southern Cal's other split titles (2006 and 2007), California and Arizona State do not get any credit because the Trojans owned the head-to-head tiebreaker. Somewhat ironically, the 2 schools with the worst records over the past 5 seasons (combined 19-69) won 2 conference titles in the first 3 seasons of the decade (2000 and 2002). And finally, what was the biggest takeway from the 00 decade in the Pac-10? I'm not going to go with the obvious and say the re-emergence of the Trojan empire. No, I'll say its the shift in power in the Pacific northwest from the Washington schools to the Oregon schools. The table below lists the combined winning percentage of the Oregon and Washington schools broken down into 5 year windows beginning in 1990. As you can see, the Oregon schools began the 1990's as pretty forgettable outfits. Oregon was an occasional bowl contender, but the Beavers from Oregon State were awful (3 straight single win seasons from 1990-1992). Meanwhile Washington was busy winning conference and national titles (1991) and the Cougars from Washington State would balance out 3 and 4 win seasons with an occasional bowl bid. As the decade wore on, Oregon continued to contend for bowl games and also won the conference in 1995. Oregon State steadily rose, adding to their win totals each season beginning in 1996 and culminating with their first bowl bid in 35 years following the 1999 season. Washington slipped in the Pac-10 pecking order, and while the Cougars went to the Rose Bowl in 1997, they did not have a winning season in the 2 seasons prior or the 3 seasons after. When the new decade dawned, Oregon and Oregon State enjoyed some of their finest seasons in school history. Washington also stayed relevant at the beginning of the decade, and Washington State enjoyed 3 consecutive 10-win seasons from 2001-2003. However, in the second half of the decade, the Oregon schools continued to churn out winners, posting just a single losing season between them since 2005, while the Washington schools have not had a winning season between them since 2003! Washington appears to be back on the rise under Steve Sarkisian, but Washington State is mired in deficiency. Perhaps massive changes await in the new decade, but for now it appears the state of Oregon is king in the Pacific Northwest. This week in our SDPI posts, we'll try to shed our East Coast bias as we trek out west to examine the Pac-10. As usual, this first paragraph will explain how SDPI is calculated. So if you want the meat of this article skip on down. In the 2009 Pac-10 regular season, conference play only, the average Pac-10 team gained and allowed 3383.4 yards. The standard deviation for yards gained (offense) was 617.95 yards. The standard deviation for yards allowed (defense) was 460.26 yards. Arizona gained 3630 yards and allowed 3044 yards. Their offensive SDPI was 0.40 = [(3630-3383.4)/617.95]. Their defensive SDPI was 0.74 = [(3383.4-3044)/460.26]. Their total SDPI was 1.14. This number ranked 3rd in the Pac-10. To refresh your memory, here are the 2009 Pac-10 standings. Now here are the 2009 Pac-10 SDPI standings. The standings are sorted by total SDPI with ranking for each category (out of 10 teams) in parentheses. The big story in the Pac-10 in 2009 was the fall of the mighty Trojans. After winning outright or sharing 7 straight conference titles, and being a national title contender year-in and year-out, the Trojans slipped to the middle of the Pac-10 standings. Based on SDPI, their fall was no fluke brought about by poor luck or happenstance. The Trojans' offense was slightly below average and their defense was just a shade above average. Altogether, the Trojans were a middling team and their record reflected as such. However, there were 2 Pac-10 teams with conference records that didn't quite match up with their actual performances. Despite the fact that they fielded the worst offense in the Pac-10 this side of Washington State, the Sun Devils from Arizona State made up for it by fielding one of the league's best defenses. However, their poor mark in close games (0-3 in Pac-10 play in one-score games) and poor turnover margin (league worst -12) led to a poor 2-7 league record. Meanwhile, Cal won more games than they lost in the league despite being statistically the worst team besides Washington State thanks to an unblemished mark in close games (3-0 in one-score league games) and a solid turnover margin (+3). Maybe the Pac-10 had a lot of bad defenses, maybe it was just a statistical quirk based on a relatively small sample, or maybe the Oregon offense had a tough time getting going, but the Ducks had quite a conference/non-conference split in 2009. In their 4 non-conference games (began the year with 3 straight non-league games), the Ducks averaged 270 yards per game, never gaining more than 356 yards in any contest. In Pac-10 play, Oregon averaged 475 yards per game. The Cougars were held below 200 yards in two-thirds (6) of their conference games. The Cougars somehow managed to gash Cal for 440 yards of offense, yet still lost by more than 4 touchdowns. The Cougars scored 10 touchdowns in their 9 conference games. Outside of a no-show at Stanford (505 yards allowed at 7 yards a pop), the Oregon defense acquitted itself very well, holding 5 league teams under 350 yards. In their best defensive showing, the Cougars 'held' Southern Cal to 403 yards. If they allowed that many yards in every game, they would have finished 9th in the Pac-10 in defense! The Trojans will be back in their customary place in 2010 right? 2009 was just a bump in the road and a slew of Rose Bowls are in the future right? Maybe not. Why? Well, as mentioned earlier, the Trojans were not a particularly good team in 2009. Their offense and defense were right around average by Pac-10 standards, and the Trojans were actually outscored by 9 points in their 8 conference games not involving Washington State. Don't forget the Trojans will also be breaking in a new coach, a coach who has yet to accomplish anything of note I might add, and will also be losing a great deal of talent including all 4 starters in the secondary. Don't pencil the Trojans in for a return to glory just yet. That's good news for the other 9 teams in the conference, but may be bad news for the Pac-10's national reputation. The 2010 Pac-10 could be a lot like the 2009 Big East in that it is a major conference with no real favorite heading into the season. So who could contend for the title in 2010? The defending champs from Oregon seemed poised to make another run at the Rose Bowl, until some minor legal issues emerged in the offseason. Stanford loses star running back Tobey Gerhart to the NFL Draft, but does return 7 other starters from the 2nd best offense in the conference. If the defense can get a little better, Jim Harbaugh will once again be one of the hottest coaching commodities come December. Mike Riley has built a consistent winner at a former college football outpost, and the Beavers have finished just one game shy of the Rose Bowl each of the past 2 seasons. The defense loses only 3 starters, and should remain one of the league's best, but the offense must break in a new quarterback and will likely go through some growing pains. Arizona State will certainly be better than their 2-7 conference record in 2009, but massive improvements on offense are unlikely as the starting quarterback, running back, and top-2 receivers must be replaced. Rick Neuheisel has yet to post a competent offense in his 2 seasons in Los Angeles, so the Bruins will likely play a few games in the Rose Bowl, but none in the postseason. Washington will likely be a trendy pick in the preseason, and the Huskies certainly showed marked improvement in Steve Sarkisian's first season, but they were still statistically one of the worst teams in the Pac-10 (below average on both sides of the ball). Cal won more Pac-10 games than they lost last season, but in their 4 losses, they were far from competitive. In loses to Oregon, Southern Cal, Oregon State, and Washington, the Bears were outscored by nearly 29 points per game (and 2 of those losses came at home). The Bears defense was also the 2nd worst in the Pac-10 last season, so the chance that they end their 52-year Rose Bowl drought is unlikely. As for Washington State, well if they somehow manage to win the league in 2010 (hell, if they qualify for a bowl game), it will be one of the biggest surprises of all time. So who does that leave? Arizona. Lesser Stoops has been quietly building a contender in Tucson. Sure the Wildcats didn't exactly end the season on a positive note, losing 33-0 to Nebraska in the Holiday Bowl, but they were solid on both sides of the ball in the Pac-10. If they can overcome the loss of offensive coordinator Sonny Dykes (head coach at Louisiana Tech) and some attrition on defense, the Wildcats could find themselves in their first ever Rose Bowl come early January. Thus far in our offseason half-decade retrospective, we've looked at the ACC, Big East, and Big 10. Now we examine the Big 12. Care to hazard any guesses as to who the 2 best teams in this league are? First off, here are combined Big 12 standings from 2005-2009. Texas and Oklahoma are the Yankees and Red Sox of the Big 12. However, Texas is the only team to have gone undefeated in league play (2005 and 2009). Over the past 5 seasons, the Red Raiders from Texas Tech have not only been the 3rd best team in what has amounted to a 2 team league, but they have gone a respectable 4-6 against Texas and Oklahoma (beating Oklahoma 3 straight times in Lubbock). And while the Red Raiders have made a habit of taking it to the bullies of the Big 12 on numerous occasions, they have also been subject to a few shockers as well. The Red Raiders have lost 3 straight at Oklahoma State, once to a very good Cowboy team (2009), once to a thoroughly mediocre Cowboy team (2007), and once to a Cowboy team that would have gone winless in the Big 12 if not for the generosity of Tech (2005). The Red Raiders also dropped home games to lackluster squads from Texas A&M (2009), Missouri (2006), and Colorado (2007) teams. If the Aggies and Buffs had not won those games, they would not have even been bowl eligible. Elsewhere in the standings, Missouri and Nebraska have clearly been the cream of the crop in the Big 12 North. Oklahoma State and coach Mike Gundy deserve major kudos. After bottoming out in his first season at 1-7, the Cowboys have nearly clawed their way back to .500, going 18-14 in league play over the past 4 seasons. Baylor is the lone Big 12 team to not post at least a break even mark in league play at least once since 2005. The Bears (2007) are also one of only 2 teams (Iowa St in 2008) to post winless seasons in league play. Now here is the standard deviation of each team's conference record (in wins). Teams are ranked from the most inconsistent to the least. Kansas has been the most inconsistent Big 12 team of the last half-decade. This is primarily the result of their dream 2007 season (7-1), followed shortly thereafter by a 1-7 nightmare (2009) that saw them lose their final 7 games and ultimately cost Mark Mangino his job. Oklahoma has been the most consistent team, alternating 6 and 7 win seasons from 2005 through 2008, before bottoming out (relatively) with 5 league wins in 2009. Now here is each team's point differential in conference play since 2005. The point differential standings align almost perfectly with the actual league standings. The only real head-scratcher is Missouri's large lead over Nebraska in point differential (+221 points) resulting in only a one-game lead in the standings. All of this difference can be attributed to the historic 2007 season that saw Nebraska sink to new lows and Missouri reach new heights. Missouri's point differential (+154) was 236 more than Nebraska's (-82) that season. if we remove 2007 from the equation, Nebraska actually has a slight advantage in point differential (+113 to +96) and in the standings (21-11 to 17-15). With this being the end of the decade, here's the tally of conference and division titles. Again, no shocker. Well, maybe a little. While Texas has the better league mark since 2005, Oklahoma really dominated this conference in the first half of the aughts. They won 4 of 5 South Division titles and thrice went unbeaten in Big 12 play (regular season). They were 36-4 against the Big 12 from 2000-2004. Of course, Texas was no slouch, compiling a 34-6 record over the same span. However, the Longhorns never defeated the Sooners in that stretch and won only a single division title, which they blew as heavy favorites to Colorado in 2001. The South has been favored in each Big 12 Championship Game in the past decade, and the pair of titles won by the North occurred in somewhat shocking (Colorado over Texas in 2001) and ultra-shocking fashion (Kansas St over Oklahoma in 2003). And finally, what was the biggest takeaway from the 00 decade in the Big 12? The fundamental shift in power from the Big 12 North to the Big 12 South. When the Big 12 was formed in the mid-1990's the class of the conference was clearly in the North. Nebraska had just won back-to-back national titles (94 and 95). They would contend for another in 1996 before sharing the title with Michigan in 1997. Kansas State was experiencing its finest decade ever under Bill Snyder. Colorado was still a national player, appearing in bowl games in 10 out of 11 seasons from 1985-1995, along with a somewhat dubious national title in 1990. It should be noted that when the league formed, even perennial doormat Kansas was coming off a 10-win season in 1995. Meanwhile, the 2 big boy programs in what would be the South were experiencing some of their worst times. Howard Schnellenberger and John Blake conspired to run Oklahoma into the ground, posting a 17-27-1 record in their 4 combined seasons (1995-1998). While Texas did upset Nebraska in the first ever Big 12 Championship Game in 1996 (for which Steve Spurrier is eternally grateful), the Longhorns managed only a 41-28-2 record in 6 seasons under John Mackovic (1992-1997) and lost at least 4 games each season save one. After the schools canned Blake and Mackovic, they certainly hired the right men for the job. Meanwhile, back in the North, Nebraska slipped a little under Tom Osborne's successor Frank Solich. After releasing him of his duties, they slipped a lot more under Bill Callahan. Kansas State also slipped under Bill Snyder. Upon his retirement, the program slipped a lot more under his replacement Ron Prince. Colorado also slipped under Gary Barnett and then really faceplanted when they hired zen guru Dan Hawkins to take his place. The fall of these 3 powers allowed programs such as Missouri, Kansas, and Iowa State to enjoy some of their finest seasons in the late-1990's and 2000's. However, the fall of those formerly elite 1990's programs caused a severe divisional imbalance. In the 1990's, Big 12 North Division teams were a combined 42-30 against teams from the South. That's good for a winning percentage of .583. 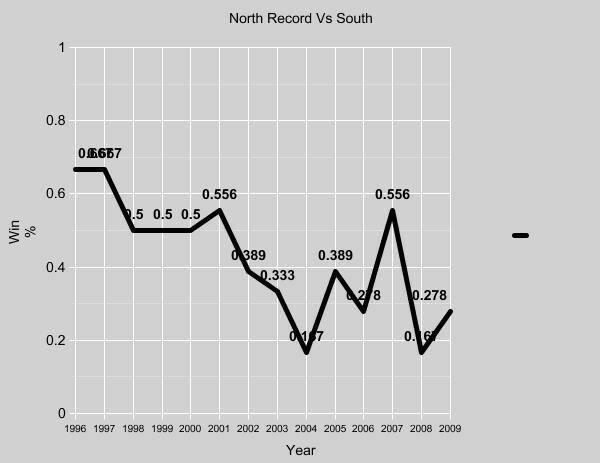 In those 4 seasons, the North never finished worse than 9-9 against the South. Since 2000, the North has enjoyed exactly 2 winning seasons against the South (2001 and 2007). In both those seasons, the North went 10-8 against the South. They also broke even in 2000. From 2000-2009, the North has gone 65-155 against the South. That's a winning percentage of .361. 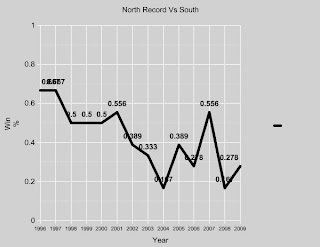 The chart below shows the Big 12 North's winning percentage versus the South since the conference formed prior to the 1996 season.